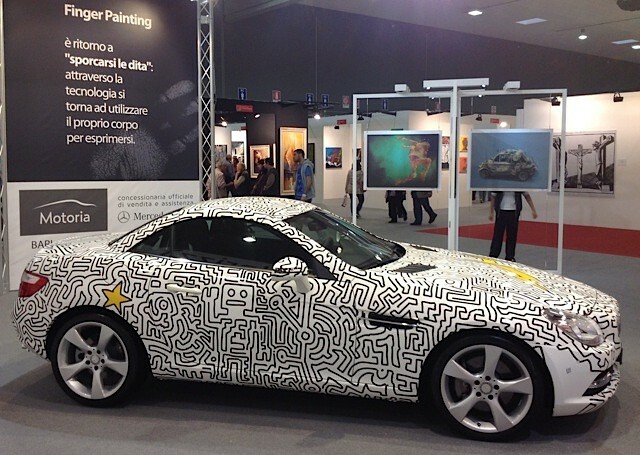 The fingerpainted car on display at Expo Arte in Italy. Courtesy Matthew Watkins. 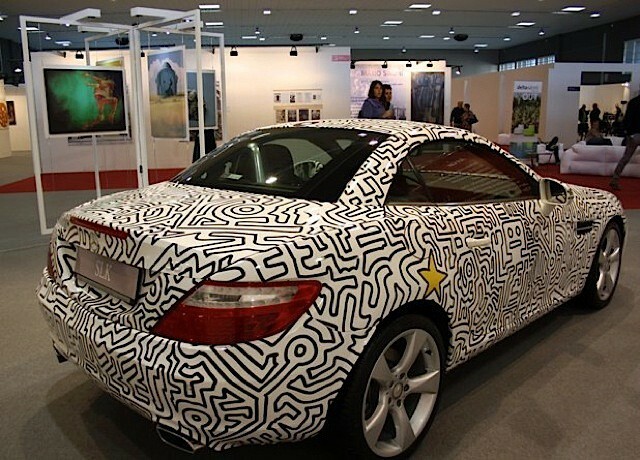 iPad artist Matthew Watkins let his fingers do the walking to turn this Mercedes-Benz SLK Diesel convertible into a work of art. It took about a week, some dexterity with a glue gun and a few thousand dollars. 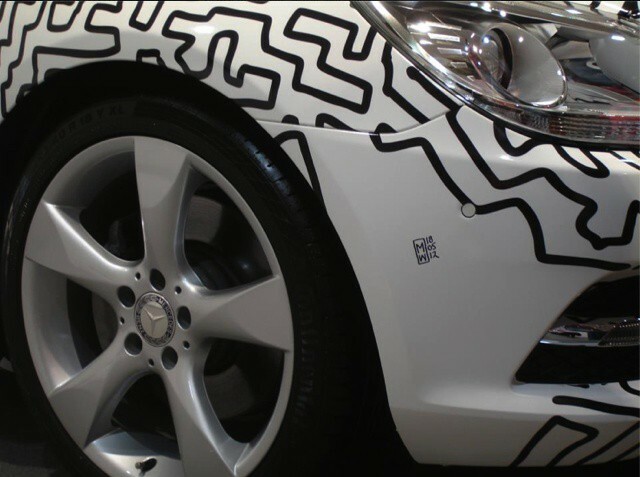 Watkins pimped this ride with black and white doodles at the behest of auto dealer Maldarizzi and organizers of recent art show Expo Arte held in Bari, Italy. Cult of Mac readers may remember Watkins from one of the first ever iPhone art shows at an Apple reseller. In that show, he also mixed fingerpainting with cars, drawing a Fiat 500 and printing it as a carpet. Watkins talked to Cult of Mac about how he did it and his favorite apps. The signature of the artist on the customized skin. Courtesy Matthew Watkins. Cult of Mac: How did the fingerpainted car come about? CoM: It reminds me a little of Keith Haring, was he an inspiration? The fingerpainted car. Courtesy Matthew Watkins. CoM: How long did it take and how much did it cost? MW: It took two days to create my painting and about four days to print and skin it. Car skinning is done by printing to film and applying it with a heat gun. It’s a little tricky and probably not something you want to do yourself. A skin costs generally about EU€1,000 to €1,500 (about $1,250 -$1,800) including printing and application. CoM: What apps are you using? MW: For this I used Brushes app, taking advantage of its good output capabilities. I could have done it in Adobe Ideas, or in Inkpad, both great vector apps. But I found it more playful in Brushes. 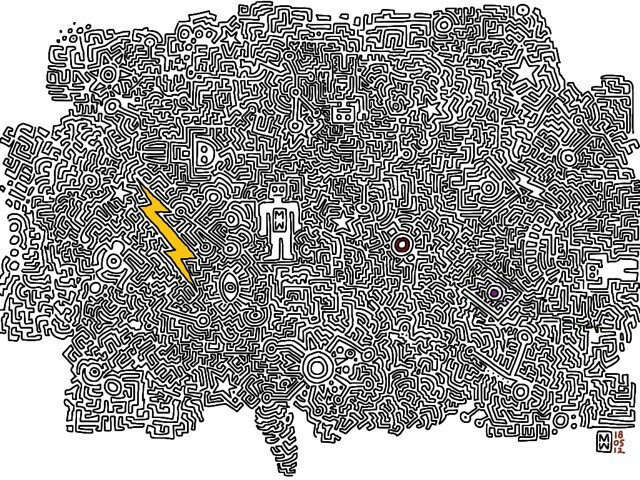 The work, in effect, is a free-flowing doodle incorporating robots symbols and a maze of lines. The full skin design, done with the Brushes app. Courtesy Matthew Watkins. CoM: Have you switched from any of your favorite apps, or started using anything new? MW: A new favorite app of mine is Procreate, I find it the best performing painting app on the iPad 3 at the moment. It does 1920×1408 resolution, but enough to cover the just-over four-meter long vehicle. CoM: If you had to do it again, what would you do differently? MW: In terms of process, nothing. Just paint and have fun. I can’t wait to do another. I am planning a whole show of them involving some friends. CoM: What happens to the car, post show? MW: This will remain a one-off piece, hand signed. It will be on tour for a while to promote this new art form. And will be put on display in the Madarizzi show room for a while and then sold, with the skin. CoM: What advice would you give to iPhone/iPad artists who want to convince people to show their work? MW: Don’t let people denigrate digital art. It’s the creativity and expression that is important. Let them know that it is a manual process. It’s just painting, and it’s here to stay.